As most of you know, the Tater Team just got off of a two week break in their home town of Boise (well Paul is from Fargo, ND, but we don’t hold that against him). Last Monday the crew got back on the road for what was the beginning of their last month. It started out in Reno but quickly crossed over into the Golden State where they would head south down the coastline. After many exciting events the 12,000 lbs spud ended the week in the Bay Area, allowing the team time to explore San Francisco. 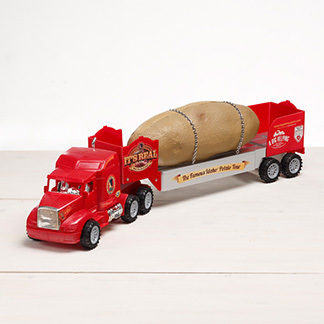 The potato had to stay at home for that trip, but it was in good hands at the local Neighborhood Church. Monday was one of those days where you start driving early in the morning and then… well… you keep driving until about 8:00 at night! It was a long haul to Reno but the team pushed through in one sitting. Tuesday they had an exciting event at a local Scolari’s where about a hundred kids came out from a local elementary school. There was a wide range of tots as young as five and going all the way up to twelve years old. 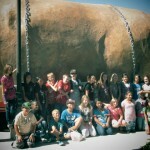 The kiddos were run through a gauntlet of facts about our tour, our giant potato, and Idaho potatoes in general. Afterwards they were quizzed and given prizes for correct answers! The kids did such a great job that the Tater Team actually gave out the remainder of their prizes during this event. By the time they went back to school, everyone felt as if they had taken something memorable away from the experience. Before we get started on Wednesday I want everyone to do me a favor. Go to maps.google.com and have it calculate the distance from Reno to Sacramento. Now look at how long it takes to drive that far. Okay now just completely forget about that because it took the team about eight. 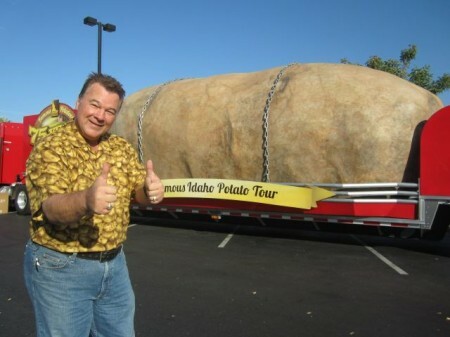 You see, when you drive a 12-foot wide potato around, sometimes they don’t let you go on certain roads. I know right? They should be PAVING roads for us to go on. 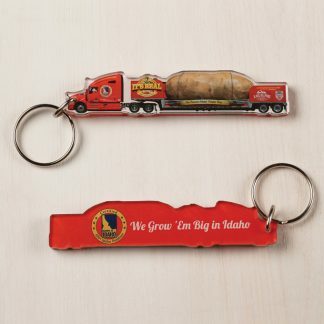 But since they didn’t, Wednesday was spent in the truck as they ventured north, to Redding, California, and then back down south to Sacramento. They did it in style, though, with their first long term pilot car that helped them navigate the narrow mountain passes and their protruding granite. The good news was that we made it safe. The bad news was that every restaurant within a two mile radius had closed for the evening. Some luck. 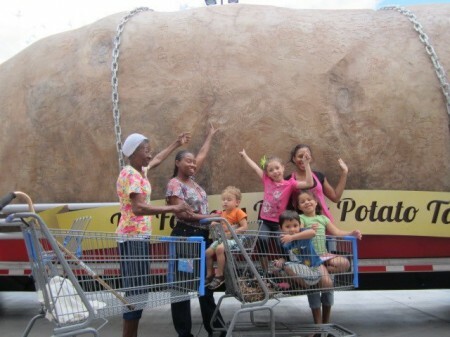 Just some more crazy fans having fun in front of our potato! Luckily for the team, Thursday was a new day! They got up at the crack of dawn to meet Michael Marks, AKA ‘The Produce Man’, for a couple of morning segments on Good Day Sacramento. Mr. Marks was sporting an oh-so-festive shirt to show his support for America’s favorite vegetable while he enthusiastically covered Idaho’s pride and joy. 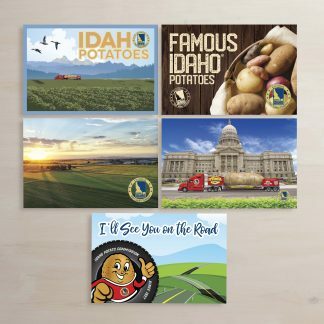 The two spots touched on the health aspects of Idaho potatoes as well as some stories from the road. 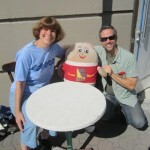 They also allowed the crew to be the FIRST media organization to broadcast the inside of the potato. The historic morning was welcomed by many fans that got out of bed to see the spud at Raley’s before starting the rest of their day. By Friday the team had reached the Bay Area and were preparing for their first event in Oakland. That night they ventured into downtown to meet Mani, former Caldwell resident and the owner of Sweet Bar Bakery, and check out the city’s monthly Art Murmur. The event highlights the cultural and artistic venues around the city and, of course, provided many food carts for the Tater Team to choose from. 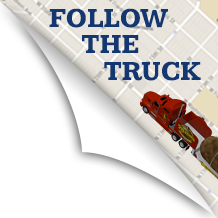 After realizing the possible troubles of parking the truck in Downtown Oakland, the crew decided to make an early go at it and arrive shortly after the street sweepers finished up… at 6:00 AM. Lucky for them, Saturday morning proved to be a recovery day for most of the city so the team was able to get the front row street parking they desired. But since they got their about five hours before the event was supposed to start they took a quick snooze in the tractor’s spacious sleeper, waking up every two hours to feed the meters. 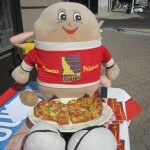 The people in downtown Oakland loved our potato and loved the potato flat bread that Mani was giving out to the spectators. 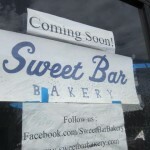 His bakery is set to open in about five weeks and you could tell the locals were getting excited to test it out. After sampling a huckleberry upside down something-or-other (I’m not good with names) and a mascarpone cupcake with fresh fruit, I can attest to the gem Oakland is about to receive. In fact, it turns out that through a series of ‘fortunate’ events, Mani was, once upon a time, the personal chef for Michael Jackson. You have to imagine that with a resume like that he is definitely no slouch. After the event the team was freed up to explore all that the Bay Area had to offer. For the majority of the time this meant heading into San Francisco, with millions of other tourists, to eat, watch air shows, Blue Grass festivals, street fairs, football games, baseball games, etc. etc. etc. To say the least, it was a busy weekend and everyone was tired from pounding the pavement and exploring the diverse offerings of the City by the Bay. 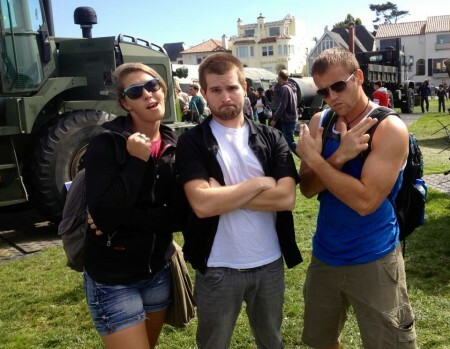 Kaiti and Ellis posing with an old friend, Tyson, at the Air Show in northern San Francisco.